I met David in California. We’d lived there together for two years before moving to England. He’d started the painting of Christopher Isherwood and Don Bachardy [seen in the background, above] in their house in Santa Monica, and had shipped it over to finish in London. This candid moment between David and [the model] Maudie James was shot in David’s London studio. David was pretending to paint. I don’t think I was meant to be in the picture at all – I just happened to be there. We weren’t directed or asked to wear any fashionable clothes. Cecil Beaton focused on Maudie – we were just there in the background. It was a very exciting time for me: I had just arrived in London and was 20 years old. I had never met Cecil before. He was formidable: very witty but also quite terrifying. He was snooty and snobbish and I was just this little kid. Sometimes he was quite dismissive. But later we became good friends. 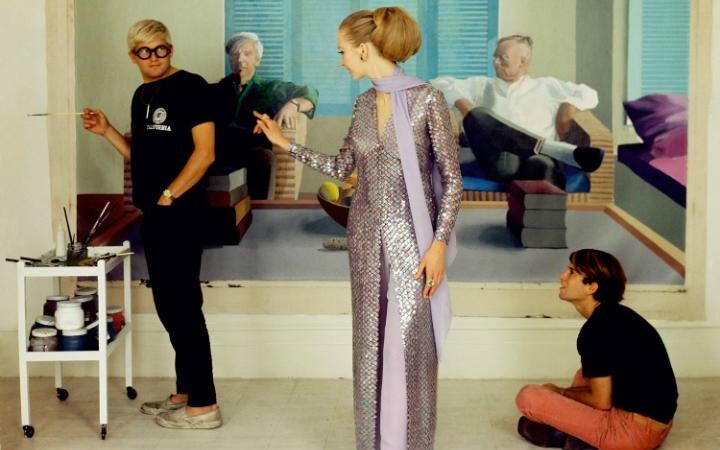 The Telegraph celebrates 100 years of Vogue with this Cecil Beaton photograph of David Hockney, in front of his portrait of Don Bachardy and Christopher Isherwood. Words by his then boyfriend, Peter Schlesinger (seated, obvs). National Portrait Gallery: Vogue A Century Of Style. Wonder if NPG is selling a postcard or print?